From the start of draft season I was a member of the Josh Gordon bandwagon, claiming that he was worth the risk if the price is right. While I wasn’t one of those driving the Gordon train (I’m looking at you Pat Mayo), I did advise everyone to add him in Rounds 9-10 if they could. That was my strategy in EVERY league this year. Well… it turns out that plan didn’t work in any league, except one, a home league of mine, where I was able to secure Gordon with my second to last pick. I franticly clicked draft, but was blocked by roster restrictions. I did not have a kicker or defense, and it was mandatory (let me take this time to express my HATRED for roster restrictions). Just like that, Gordon slipped through my fingers. Once the draft ended I put in a waiver claim for Gordon, but then the news that he could be reinstated came out. Due to being low on the waivers list (before a game was even played! ), I missed out on Gordon. To add insult to injury, this is a keeper league. But just to kick me while I’m down, the team that now has Gordon is playing me this week. 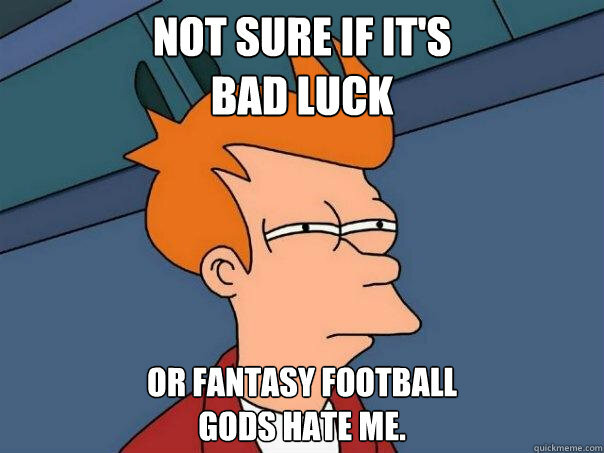 Now, I’m not one to blame the “Fantasy Gods,” but, WHY FANTASY GODS?!? Well, that was my way of saying Happy Josh Gordon week. If you missed out on adding him, whether it be through the draft or on waivers, don’t worry, I’m here to help. Welcome to The Watch List, where most of the players listed are calling the waiver wire home, but could be on the brink of a breakout and the next waiver wire darling. Keeping an eye on these players will help keep you one step ahead of your league mates. Brian Hoyer (Cleveland Browns, Quarterback) – You can’t expect me to go on a Gordon rant, and not mention the guy who will benefit the most. Hoyer has proven to be a QB2 in all leagues, coming in 17th in leagues that play with four-point passing TDs, and 20th in leagues that play with six-point passing TDs. He has done so in an offense that relies on the run, but he did sling the ball 50 times in the last game. While he has some nice weapons to target, he’s lacked a game-changing wide out, but that changes this week. 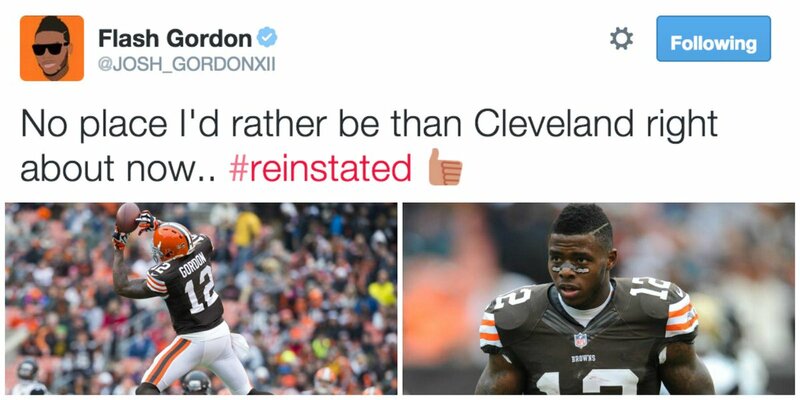 In their first game together in 2013, Hoyer targeted Gordon 19 times, completing 10 passes for 146 yards and a TD. Not only will Gordon provide the deep threat the Browns are missing, he has the ability to bring the ball to the house any time he touches it. While I personally can’t wait to see when Johnny Manziel and Josh Gordon tear up the league (if they ever do), for now, Hoyer is here to stay as a reliable QB 2. Scout Level: Should be scouted in 14-team leagues and picked up in all two QB leagues. Juwan Thompson (Running Back, Denver Broncos) – There is one factor that makes Thompson an intriguing option; opportunity. The Broncos will be without Ronnie Hillman and Montee Ball this week, and while C.J. Anderson has looked good as the starter, he can’t do it alone. He has never carried the ball more than 13 times in his NFL career, and he set a career high in touches last week with 17. His workload could grow, but it is unlikely that the Broncos will end their trend of rotating running backs. Thompson has filled in nicely when called upon this season, averaging four yards per carry, and finding pay dirt three times. Going against a physical Dolphins defense, Anderson will need someone to help carry the load, and that is where Thompson gets his shot. If the reports that Hillman’s injury is more severe than originally thought, Thompson could be a valuable asset going forward. Scout Level: Scout in all leagues. If you own Hillman, he is a good insurance policy if you missed out on Anderson. Dan Herron (Indianapolis Colts, Running Back) Chances are you likely haven’t seen much of Herron (let alone heard of him) before this week. Don’t worry, I watched some film on him and can tell you this; the former Ohio State running back is more elusive and explosive than Trent Richardson. Trent “3.4 Yards per Carry” Richardson hasn’t seen double-digit touches for two straight games. While he likely will be the lead back this week, don’t be surprised if Herron is a large factor in that Bradshaw-esque role. He has good hands out of the backfield, can make a defender miss, and displays good speed in the open field. He is given a great match up this week against the Jags, and could make this week his coming out party. Plus, his nickname is Boom. Scout Level: Scout in all leagues. Indy will need someone to run the ball, and likely doesn’t want Richardson touching the ball 20-plus times per game. Add now if you want to ensure you land him and have a roster spot. Kenny Britt (St. Louis Rams, Wide Receiver) – Has any player received as many chances as Kenny Britt? I’m not even talking about the legal troubles that nearly derailed his career. He was a preseason sleeper for many, than when Brian Quick went down, he was once again surrounded with hype, but he continued to disappoint. However, the reason I’m buying in this time is the change at QB from Austin Davis to Shaun Hill. Britt looked to be blossoming into Hill’s go-to guy, leading the team in targets with seven. That tied his season high, and he hauled in four receptions for 128 yards and a TD. Granted, most of that was on one deep throw, a 63-yard touchdown, but Hill has a strong arm and the deep ball to Britt could be a new aspect to the offense to help stretch the field and make life easier on the RBs. Many are hesitant to buy into the Britt hype, once again, but if he has another strong game this week, he will likely be the most sought out WR on the waiver wire. Scout Level: Scout in all leagues. Cody Latimer (Denver Broncos, Wide Receiver) – The sneakiest name on this list. The Broncos could be without Emmanuel Sanders and Julius Thomas this week. The simple thinking is Jacob Tamme and Wes Welker will be more involved, and that is not wrong. However, neither of those will match the production of the Broncos that will be missing, but the athletic, big bodied WR could step in and become an instant red zone threat. Latimer only has one target on the year, a nine-yard grab, and has only played 16 snaps. The Broncos have been easing Latimer into the offense, but now is the time for them to cut him loose. He could ease the blow (keyword ease) of losing the downfield threat of Sanders, and dominant red zone play of Thomas and in one big game he could work his way into the rotation going forward. Scout Level: Speculative scout, but all owners should keep an eye on him if Sanders and/or Thomas sit. Jacob Tamme (Denver Broncos, Tight End) Yes… another Bronco. But with all the injuries, new players are going to get opportunities. Any player getting a chance with Peyton Manning is worth keeping an eye on. Tamme and Manning have a long history together, specifically when they connected for 67-631-4 in 2010 with the Colts. They had a solid season in 2012 as well, when they hooked up for 52-555-2. If Julius Thomas is out, Manning will rely heavily on Tamme, evident in his season high 10 targets last week against the Rams. To put that into perspective, Thomas has not had more than eight targets in any game this season. If Thomas sits, Tamme works his way into the Top-12 TE rankings. If both Thomas and Sanders sit, he becomes a must start option. Scout Level: Monitor the Broncos situation all week, if Thomas sits, add Tamme. Feel free to add him now if you need a TE, I did. Do I have to answer this question? Prime time games have been struggling to remain close already this year, but I’m not sure the fans of either team are too excited for tonight’s match up. Electing not to double dip (I have recently written about Latavius Murray, Kenbrell Thompkins and Andre Holmes) and there not being many Chiefs worth scouting that aren’t owned already, we have a winner by default. De’Anthony Thomas (Running Back, Kansas City Chiefs) Thomas is listed on the Chiefs’ depth chart as both a running back and a wide receiver, showing that they like to use the electric runner in a variety of ways. The rookie fourth rounder has yet to receive much of an opportunity, only seeing seven carries and eight catches this season. But if this game gets out of hand, as many suspect, he could be brought in to provide some rest for Jamaal Charles in a short week. Thomas has played nearly 12 percent of the Chiefs’ snaps this season, but that number is on the rise, as he was on the field a third of the time last week. If given the opportunity, the electric Thomas will look to turn some heads on Thursday night. Scout Level: Deep leagues only.